Mutual support exchanged by people struggling with similar challenges is as old as humanity itself. 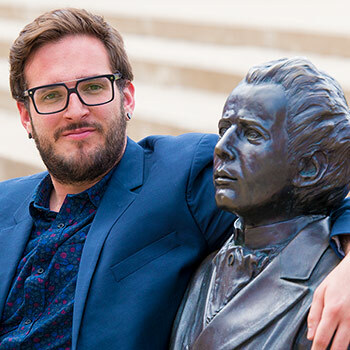 Recently, however, something has changed: peer support is becoming a formal profession in the mental health field, says Simon Coulombe, a Wilfrid Laurier University assistant professor of Community Psychology. Growing numbers of hospitals, clinics, treatment centres, community support programs and social service agencies employ trained and often paid people who have lived through experiences such as mental illness and addiction. The national-level body Peer Support Accreditation and Certification (Canada) (PSACC), which was created only in 2011, has identified core competencies, knowledge and skills, and created a certification process for peer supporters. However, there has been little research to date on what makes for an effective peer support program in Canada. Coulombe and a multidisciplinary team are working to change that. Coulombe recently received a grant from the Canadian Institutes of Health Research (CIHR) to lead a project that will examine peer support programs across the country. His goal is to identify about 10 programs or initiatives that are working well and figure out why. The research is based on principles of positive psychology and appreciative inquiry, which focus on what is going well and why. Where there are challenges, the focus is on improving matters in the future more than on than solving current problems. Coulombe isn’t just studying people who have lived experience of mental health issues – he’s involving them. Peer support workers and people who have received peer support services will be hired and trained as researchers and interviewers. “The goal is to consider their expertise, to give an opportunity for those individuals to bring their experience to the table,” says Coulombe. Project partners include PSACC and collaborators from the IWK Hospital (Halifax), the Saskatoon Health Region, St. Joseph's Healthcare Hamilton, and the Université du Québec à Montréal. Peer support services can be a complement to rather than a replacement for more traditional medical, psychological or social services, says Coulombe. For instance, a doctor might prescribe medications that reduce symptoms, a social worker might help clients obtain supports such as affordable housing, and a psychologist might provide cognitive behavioural therapy. A peer support worker might be able to help clients figure out strategies to self-manage their daily challenges, inspire hope, and increase readiness for change. It can be tricky for mental health programs to balance these roles. From the literature, Coulombe has identified a few challenges some peer support workers face. One challenge is that in clinical settings in particular, peer support workers have trouble feeling integrated as members of the team because they don’t have the same kind of training as a doctor, psychologist or social worker. Their experiential knowledge may be undervalued or even stigmatized. PSACC’s certification process was designed in part to respond to those concerns, says Coulombe. Another challenge is awareness. Peer support programs are not well known, neither among people who might benefit from such programs nor among people, such as social workers, teachers and doctors, who might be able to refer a potential client to a peer support program. Since Coulombe’s one-year project is just getting started, there are still many unanswered questions. One area to examine regards the structural and organizational supports needed to sustain peer support programs. For instance, who should supervise a peer support worker – a senior peer support worker? A psychologist? Another question is how much peer support workers can or should help people whose mental health challenges are different from the ones they have lived through – for instance, how well can a person who has experienced depression help someone with bipolar disorder? What about anorexia? Yet another question is how and when peer support services are best integrated into a person’s recovery process – for instance, what role do they play when a client is in crisis? How about two years later, when the focus might be on trying to prevent relapse? Though there is much work yet to do, Coulombe already knows one thing: successful peer support programs are about hope.